by other American divisions as they became available, with the understanding that the sector was to pass to our control when four divisions were in the line. But demands of the battle then going on farther west required the presence of our troops, and the agreement had no immediate result. Due to the presence of a number of our divisions northeast of Paris, the organization of an American corps sector in the Chateau-Thierry region was taken up with Gen. Petain, and on July 4 the First Corps assumed tactical control of a sector in that region. This was an important step, but it was by no means satisfactory, as only one American division at the moment was operating under the control of the First Corps, while he had at this time eight American divisions in the front line serving in French corps. 20. The counter-offensives against the Marne salient in July, and against the Amiens salient in August. had gained such an advantage that it was apparent that the emergency, which justified the dispersion of our divisions, had passed. The moment was propitious for assembling our divisions. Scattered as they were along the Allied front, their supply had become very difficult. From every point of view the immediate organization of an independent American force was indicated. The formation of the Army in the Chateau-Thierry region and its early transfer to the sector of the Woevre, which was to extend from Nomeny, east of the Moselle, to north of St. Mihiel, was therefore decided upon by Marshal Foch and myself on August 9. and the details were arranged with Gen. Petain later on the same day. 21. At Bombon on July 24 there was a conference of all the Commanders-in-Chief for the purpose of considering Allied operations. Each presented proposals for the employment of the armies under his command and these formed the basis of future cooperation of the Allies. It was emphatically determined that the Allied attitude should be to maintain the offensive. As the first operation of the American Army, the reduction of the salient of St. Mihiel was to be undertaken as soon as the necessary troops and material could be made available. On account of the swampy nature of the country it was especially important that the movement be undertaken and finished before the fall rains should begin, which was usually about the middle of September. Arrangements were concluded for successive relief of American divisions and the organization of the First American Army under my personal command was announced on August 10, with La Ferte-sous-Jouarre as headquarters. 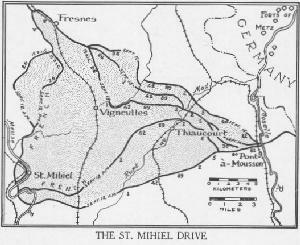 This Army nominally assumed control of a portion of the Vesle front, although at the same time directions were given for its secret concentration in the St. Mihiel sector. 22. The force of American soldiers in France at that moment was sufficient to carry out this offensive, but they were dispersed along the front from Switzerland to the Channel. The three Army Corps headquarters to participate in the St. Mihiel attack were the First, Fourth, and Fifth. The First was on the Vesle, the Fourth at Toul, and the Fifth not yet completely organized. To assemble combat divisions and service troops and undertake a major operation, within the short period available and with staffs so recently organized, was an extremely difficult task. Our deficiencies in artillery, aviation, and special troops, caused by the shipment of an undue proportion of infantry and machine guns during the summer, were largely met by the French. 23. The reduction of the St. Mihiel salient was important, as it would prevent the enemy from interrupting traffic on the Paris-Nancy Railroad by artillery fire and would free the railroad leading north through St. Mihiel to Verdun. It would also provide us with an advantageous base of departure for an attack against the Metz-Sedan Railroad system which was vital to the German armies west of Verdun, and against the Briey Iron Basin which was necessary for the production of German armament and munitions. The general plan was to make simultaneous attacks against the flanks of the salient. The ultimate objective was tentatively fixed as the general line Marieulles (east of the Moselle)—heights south of Gorze-Mars la Tour-Etain. The operation contemplated the use on the western face of 3 or 4 American divisions, supported by the attack of 6 divisions of the Second French Army on their left, while 7 American divisions would attack on the southern face, and 3 French divsions would press the enemy at the tip of the salient. As the part to be taken by the Second French Army would be closely related to the attack of the First American Army, Gen. Petain placed all the French troops involved under my personal command. By August 30, the concentration of the scattered divisions, corps, and army troops, of the quantities of supplies and munitions required, and the necessary construction of light railways and roads, were well under way. 24. In accordance with the previous general consideration of operations at Bombon on July 24, an allied offensive extending practically along the entire active front was eventually to be carried out. After the reduction of the St. Mihiel sector the Americans were to cooperate in the concerted effort of the Allied armies. It was the sense of the conference of July 24, that the extent to which the different operations already planned might carry us could not be then foreseen, especially if the results expected were achieved before the season was far advanced. It seemed reasonable at that time to look forward to a combined offensive for the autumn, which would give no respite to the enemy and would increase our advantage for the inauguration of succeeding operations extending into 1919. (a)	An attack between the Meuse and the Argonne by the Second French Army, reinforced by from four to six American divisions. (b)	A French-American attack, extending from the Argonne west to the Souain Road, to be executed on the right by an American Army astride the Aisne and on the left by the Fourth French Army. To carry out these attacks the 10 to 11 American divisions suggested for the St. Mihiel operation and the 4 to 6 for the Second French Army, would leave 8 to 10 divisions for an American Army on the Aisne. It was proposed that the St. Mihiel operation should be initiated on September 10 and the other two on September 15 and 20, respectively.